My life has taken a very busy turn and due to this, I have not been cooking as much. When I do have more time to cook at home, I always make sure we eat healthy, affordable and delicious. Things are starting to calm down some on the home front and I made a goal this week - I will only cook using products I currently own. I am shopping in my pantry / fridge! Luckily, I had a few veggies left from my last trip to the store. When I saw this weeks #SundaySupper was being hosted by my friend Lane (Supper for a Steal) and the theme was a budget supper, I knew I had to participate. Since I am not going to the grocery store this week, I had to make do with what was in my freezer. I found a nice 2.5lb Pork Loin and decided to make my version of Slow Cooker Pork Carnitas. I do not make carnitas the traditional way with frying the pork in oil. This is just as delicious and very healthy. I also buy the majority of my meats in bulk. A10lb pork loin cost me anywhere from $15-$20 and I divide it into 8 pieces. I vacuum seal the meats so they stay good in the freezer for 4-6 months. This entire meal would have cost me less than $10. Season the pork loin with the above dry ingredients. I do not have a specific measurement to it. Enough to give it a good dry rub. In a hot skillet, sear the meat, about 3 minutes each side. This will lock in the juices during the slow cooking process. Slice the onion and place in the bottom of your slow cooker. Place the pork loin on top and pour the broth and lime juice around the meat. Set on high for 10 hours. After your meat has cooked for 10 hours, drain the juices out of the slow cooker and shred your meat. Combine the shredded meat with the salsa verde and put back into the slow cooker for 30 minutes. Check out these other delicious Budget recipes from the #SundaySupper family! Gado-gado from The Urban Mrs.
Classic Macaroni and Cheese from The Skinny Chick Can Bake!!! Baked Beans from What Smells So Good? Megan, this sounds like a delicious crockpot carnitas recipe. I believe I have some pork in the freezer. I think I need to dig it out for dinner this week. LOVE carnitas, and love that you used what you had on hand to make my favorite meal! 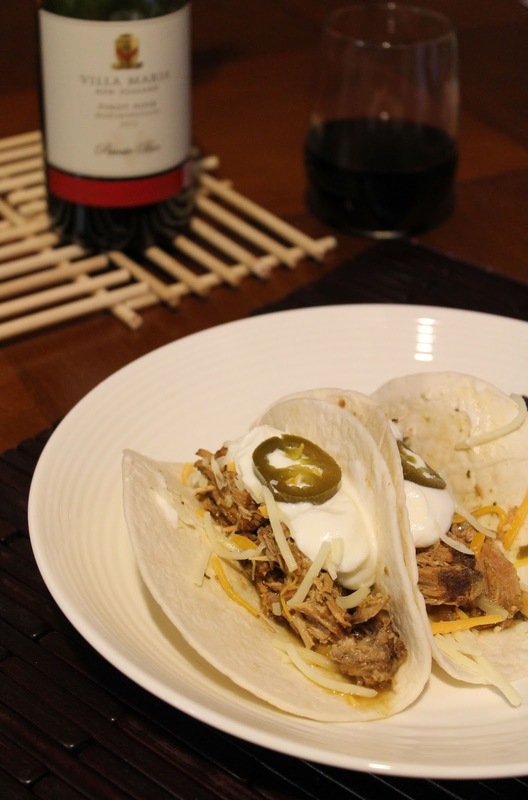 You can't go wrong with slow cooker pork and using it for carnitas is a great idea! One of my favorite all time dishes!! We have missed you and your fabulous recipes... love this one! I love pork carnitas! They are so simple to make but so good! I love carnitas, but often having a hard time finding it here! This version sounds so flavorful and easy!!! Thank you for sharing this recipe, loving my slow cooker these days and can't wait to try it! I have yet to make these! I have to give it a shot! Thanks for sharing. Love carnitas...the slow cooker is the BEST way to make them! Next time, you can stretch the filling farther by adding 1-2 russet potatoes chopped into bite-sized pieces. When I do that, I only have to use 1.5 lbs. pork, which makes enough for two meals. I haven't made this in a while thanks for the reminder! I love pulled pork tacos. I have some tomatillos in the freezer that I plan on making some green salsa soon so I will have to make this then. Love carnitas! This is a great recipe when you don't want to deal with that all fat! I don't know what I would do without my slow cooker and I absolutely love pork and carnitas. Thank you so much for sharing this recipe. It's one I am certainly adding to my slow cooker meal rotation. I love that it freezes well too since it's only the two of us.